Earlier this summer we created a totally charming set of Bar Mitzvah invitations for a kid named Ethan, and his family, here in Eugene. Ethan’s Bar Mitzvah (or Jewish coming-of-age ceremony) was to be held in early August at the local temple, with a separate celebration at the family’s home to follow in the evening. When Ethan and his mom, Jocelyn, came to visit me, we talked about what kind of theme or imagery Ethan wanted for his invitations and party. 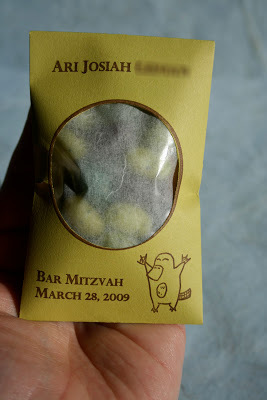 He told me all about how he was really into The Lord of the Rings and fantasy stories in general, and wanted his Bar Mitzvah invitations to reflect that. 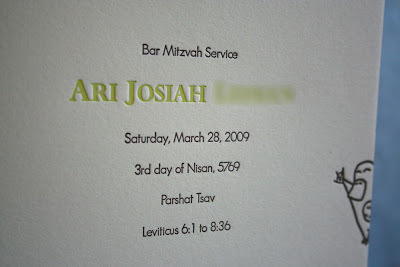 Now, this got my wheels turning quite a bit, and for a while, Jocelyn, Ethan and I planned to come up with Bar Mitzvah invitation wording that was similar to the start of the first chapter of The Lord of the Rings. You know, “When Mr. Bilbo Baggins of Bag End announced that he would shortly be celebrating his eleventy-first birthday with a party of special magnificence, there was much talk and excitement in Hobbiton…”, but instead of it being the literal text from the novel, we would alter it to have Ethan’s name and have the “party of special magnificence” be the Bar Mitzvah celebration. Well, we worked on that for a while, but since we were on a pretty short timeline for this project, we didn’t get the fancy wording all figured out. 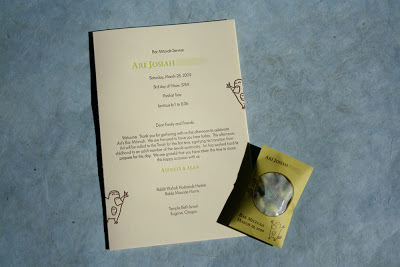 We still kept with the theme and style for the design though, and the invitations turned out totally awesome! Ethan’s invitations were one piece of paper, but included both the actual invite and a perforated reply post card for guests to mail back. In order to do this we printed the invitation and reply card together and then added a perforation right above the reply card part of the design so that guests could fold and detach just the reply card. These invitations were mailed in bright, shimmery, copper envelope that you can see in the photo above, and had the family’s return address printed in black ink on the flap. To really play up the Lord of the Rings/fantasy novel feel of the invitations, we chose some really decorative, old-fashioned fonts for all of the text. Ethan’s name was the most prominent text element of the invitation, so I made sure to find a script that was super-decorative. Lettering this fancy isn’t for every design, but I absolutely love when it works out – the way it letterpress prints is just so cool! The other two fonts we used also had an old-fashioned, celtic feeling to them, which I think also tied in with the design really really well. 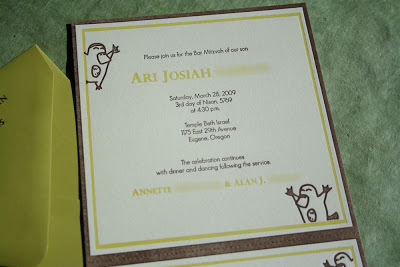 The other totally awesome design element from these invitations is the celtic knot, medieval manuscript-inspired dragon. The dragon was printed in chocolate brown and green inks and I think it added the perfect, whimsical touch to these invitations! For the text, we printed Ethan’s name and the little round, decorative element in the middle of the design in copper ink and all of the rest in chocolate brown. For the reply card portion of the invite, we used a fancy copper border to decorate the card and a copper “M” in the same font as Ethan’s name for guests to write in their names. The rest of the text of the reply card was printed in chocolate brown ink and included places for guests to indicate whether they were attending the luncheon, party or both. The back of the reply postcard (which you can see in the bottom right photo below) was simply printed with the family’s return address in brown ink. The photo on the bottom left below shows the same address printing on the back of their invitation envelopes. Aren’t these just too cool?!? I had so much fun working with Ethan and his mom, Jocelyn, this summer on these Bar Mitzvah invitations! It’s so much fun when a family comes to me with an original idea or theme and we can just run with it! Thanks so much Ethan, Ed, Jocelyn and Claudia! You rock! 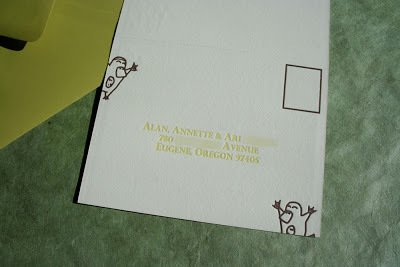 In case you haven’t noticed, this week I’ve been featuring tree-themed invitations on the blog. This wasn’t totally intentional, I just happened to realize earlier this week that we’ve been doing a lot of tree-themed designs lately and I figured it would be a good opportunity to show them off, all together, so you could see how many different possibilities can come out of one, simple theme. The designs I’ve been showing off so far have been for wedding invitations and Save-the-Date cards, but we also recently printed a fabulous set of Bar Mitzvah invitations, for a young man named Julian, in the Los Angeles area. For those of you who are unfamiliar, a Bar Mitzvah is a Jewish ceremony celebrating a boy’s coming-of-age in the Jewish community. The Bar Mitzvah ceremony is typically an ordinary Sabbath service in which the boy participates for the first time as an adult. Typically a boy becomes a Bar Mitzvah at the age of 13. There is also an equivalent celebration for Jewish girls, called a Bat Mitzvah, which happens typically when the girl turns 12. Following the service there is often a celebratory meal or other type of party with family, friends and other members of the Jewish community. If you’d like to read more about Bar and Bat Mitzvahs, you can here. Julian and his mom, Suzanne, had seen some of the Bar and Bat Mitzvah invitations I had designed and printed, here, on this blog, and decided to contact me about designing and printing Julian’s. Julian and his family wanted some sort of Tree of Life theme and imagery when it came to the invitations, but were open to having that tree image be fairly modern and more organic than other more traditional depictions. Julian also expressed to me when we talked that he liked more antique-looking typefaces, so I made sure to take that into account when coming up with his design. Julian’s Bar Mitzvah invitation suite, which you can see all together at the top of this post, included an A7 size invitation, a 4bar size reply postcard and an A7 envelope. Julian’s invitation was printed on Crane Lettra 100% cotton Ecru paper in two ink colors: a very light, sagey green and chocolate brown. I created a very organic, natural, Tree of Life that surrounds the text of Julian’s invite and bleeds off of both the left-hand side and top of the invitation. If you look at the detail photo below you can see all of the amazing detail that went into this tree – particularly in the leaves. It turned out so great letterpress printed! All of the text was printed in chocolate brown ink. I used a classic, serif typeface that reminded me of old wooden letterpress type for Julian’s and his parent’s names, and a different, classic, roman typeface for the rest of the text. Julian’s family chose to include information about both the actual service at the temple that is going to happen in the morning, and information about the evening party at a downtown hotel, on the invite. Julian and his family chose to pair the invitation with a simple, matching, ecru, square-flap envelope, also from Crane. The envelope had their return address letterpress printed in chocolate brown ink on the back flap. Like the main invitation envelope, we kept the back of the postcard very simple and printed just the family’s address on it in brown ink. The front of the reply postcard was very similar to the invite, and featured the Tree of Life image on the left-hand side, with text printed in chocolate ink to the right of it. 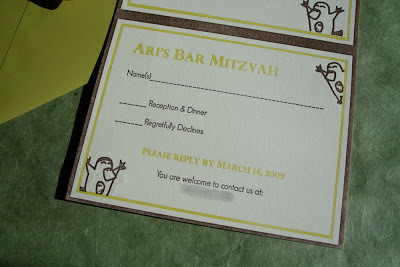 Like the reply card for a wedding, Julian’s Bar Mitzvah reply card featured a line where guests could write in their names and a place to indicate whether or not they planned to attend. This particular reply also included a portion where adult guests could choose an entree selection for the party in the evening. Isn’t it just great?!? I love the way this set turned out!! Julian and his family were really fun to work with. I honestly loved getting phone calls from Julian about the designs when we were in the middle of the design process, especially because most of my clients are quite a bit older. It was especially fun to get to work with someone so young, who was so interested in having a say in how his invitations came out! If you’d like to see some more examples of Bar and Bat Mitzvah invitations I’ve designed and printed in the past, you can check them out on this blog here, here and here. Thanks so much again, Julian, Suzanne and Randy! You guys are awesome!! At Twin Ravens Press, I print a lot of wedding invitations, which is a lot of fun, but did you know that we also print invitations for other events as well? Besides weddings, we can design and print invitations for Bar & Bat Mitzvahs, graduation parties, bridal showers, baby showers, anniversary parties, fancy corporate parties and events, etc. You name it, we can probably do it! The stationery you are going to see in this post was created for a wonderful Eugene, Oregon family that I’ve done work for before. Their youngest son, Elias is having his Bar Mitzvah on January 16th, and these are the invitations they are sending out for it. For those who don’t know, a Bar or Bat Mitzvah (Bar for boys and Bat for girls) is a Jewish ceremony celebrating a boy or girl coming of age in the Jewish community. The Bar or Bat Mitzvah ceremony is typically an ordinary Sabbath service in which the boy or girl participates for the first time as an adult. Typically a boy becomes a Bar Mitzvah at the age of 13 and girls become Bat Mitzvahs at the age of 12. Following the service there is often a celebratory meal or other type of party with the family, friends and members of the Jewish community. If you’d like to read more about Bar & Bat Mitzvahs, you can here. Pretty cool, don’t you think?!? I think that when they’re folded up they almost look like an envelope, even though they are the actual invitation. These were sealed shut with 1″ circular clear stickers that can be found at any office supply store. What’s great about doing something like this is that you are saving money on having envelopes printed and you’re saving a lot of paper! Postage for something like this is the same as a regular envelope ($0.44 if you’re in the U.S.), so you aren’t spending any extra on postage either! As I mentioned above, this card is perforated at the top so that guests can easily separate it from the rest of the invitation, fill it out and mail it back. Pretty neat design, don’t you think?!? I must begin by saying that this post is long overdue, however, I would much rather be overly-late in showing off cool things, than not show them off at all. Remember how I mentioned a while back in this post that I enjoy designing and printing stationery for a variety of other events, as well as weddings, and that I hadn’t had many opportunities to design and print for Bar & Bat Mitzvah’s but really enjoyed doing it when I did? Well, even though I finished this set of stationery back in February, I thought it would be great to show you, because it is Twin Ravens Press’ second Bar/Bat Mitzvah invitation set! This set included an invitation, reply postcard, an invitation envelope, program covers and some really cool, die-cut favor envelopes. You can see the full invitation/reply card and invite envelope at the top of this post. Isn’t it cool?!? This wasn’t all though! For the actual ceremony and party afterwords I also got to design a couple of different pieces: a program cover and some favor envelopes. The first piece for the actual ceremony was a letterpress printed program cover, in the same style, using the same fonts and platypus from the invites. 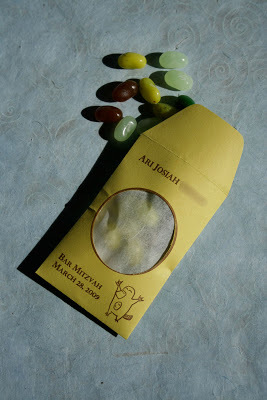 I think this was a really cool idea for a Bar Mitzvah (or really any type of party favor). If you want to make something like this for your upcoming event, Martha has a really nice little tutorial about it here. Martha’s aren’t letterpress printed, but you can get a similar effect using a rubber stamp and one of those small shape punches you can buy at a craft store (it will just take you a lot longer). What a cool idea though! I’ve heard from Annette and Ari, since the event, and apparently, everything was a big hit! If you are interested in more information about Twin Ravens Press’ custom design and letterpress printing for your child’s upcoming Bar or Bat Mitzvah or another event, please feel free to contact me at [email protected]! 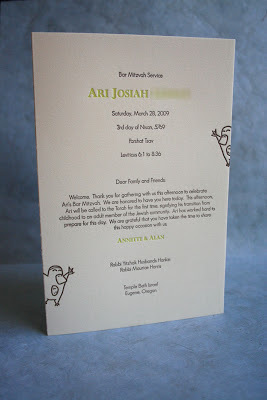 Today I thought I would share with you the first Bat Mitzvah invitation suite I ever designed and printed. This isn’t a newly completed job, but it’s less than a year in the past and I thought it was a lovely one! I’m also showing this one off because it lead us to another client who ordered invitations for her son’s Bar Mitzvah which will be held next week – those invitations turned out awesome as well, and I will share them with you soon! For those who don’t know, a Bar or Bat Mitzvah (Bar for boys and Bat for girls) is a Jewish ceremony celebrating a boy or girl coming of age in the Jewish community. The Bar or Bat Mitzvah ceremony is typically an ordinary Sabbath service in which the boy or girl participates for the first time as an adult. Typically a boy becomes a Bar Mitzvah at the age of 13 and girls become Bat Mitzvahs at the age of 12. Following the service there is often a celebratory meal or other type of party with family, friends and members of the Jewish community. If you’d like to read more about Bar and Bat Mitzvahs you can here. I really enjoy designing paper goods for various types of celebrations. Currently the majority of custom invitation work that Twin Ravens Press does is for weddings, but I also really enjoy doing invitations for different cultural rituals and ceremonies other than weddings, as well as for occasions like baby showers and birth announcements. It’s a lot of fun and is one of the things that keeps the work that I do interesting. For the back side of the reply card, we used the same large blue dahlia that we had been using throughout and then simply printed the family’s return address in the center with a little box in the upper-right hand corner for the stamp. Aren’t they pretty? 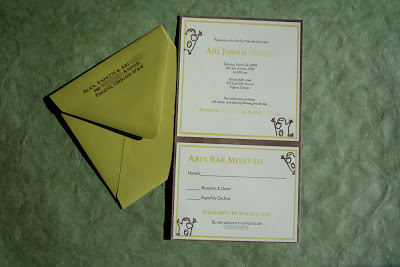 This coming week I will share with you my first Bar Mitzvah invitation suite which was just completed last month. If you would like more information and pricing on our custom bar & bat mitzvah invitations, please e-mail me at [email protected]!